The Old Town of Corfu is noted for its defence system dating from the Venetian period. It also has preserved its remarkable British Neoclassical housing of the 19th and early 20th centuries. The Venetians built two fortresses to withstand the Ottomans, in 1555 and 1588 respectively. The British demolished most of them in the 19th century, during the period when Corfu was a British protectorate (1815-1864). The Old Town of Corfu with its Venetian/British architectural mix is the odd one out among Greek WHS. It entered the list in 2007, 8 years after they were done adding the Classical Greek sites. Despite Corfu’s prominent package holiday profile (worth a million visitors a year), the WHS isn’t covered well at this website. No photos at all have been posted for example. So I was eager to explore Corfu Town as a prologue to my 'Balkan Tour 2015', which will take me to Albania, Macedonia and Kosovo. The Venetians were here for the longest period: from 1386-1797. They mainly used the site as a militairy stronghold, to keep tabs on the entrance to the Adriatic Sea via the Straits of Corfu. 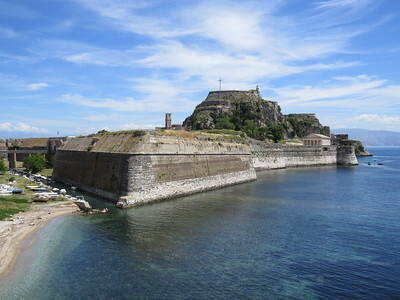 They constructed the Old and the New Fortress, which protect the town of Corfu on both sides. These fortresses still are the major landmarks and tourist attractions in town. The Old Fortress lies on an artificial peninsula. It was something like a self-contained village, where the Venetian rulers were safe from the hands of the Ottomans while the onshore general population suffered. The British used it in the same manner during the 19th century. Most buildings date from that period, including barracks and the great neoclassical Anglican Church of St. George. The New Fortress was placed on a hill, overlooking the town. It seems less visited than the Old one, maybe the steep uphill walk deters tourists. There are some nice surprises waiting at the top though, so it shouldn't be missed. First: the entrance fee of 4 EUR is equal to that of the Old Fortress. But this one is collected by a bar with an alternative streak. So included in the price is one drink of your choice. It’s best to leave that to the end, as first you will have to climb an iron flight of stairs which has seen better times. The views that await you are worth it though: especially in the late afternoon it shows Corfu, the Old Fortress and the surrounding waters in a great light. While I’m not sure about the originality or uniqueness of Corfu to be a WHS, it definitely is a pretty town seen from here. In the town proper there are a couple of buildings left from the British period that are worth a closer look. The Palace of St. Michael & St. George (now a museum) for example, and the pink Ionian Academy (not far from the cricket field!). Also there’s the remarkable Venetian theatre, turned into Town Hall. 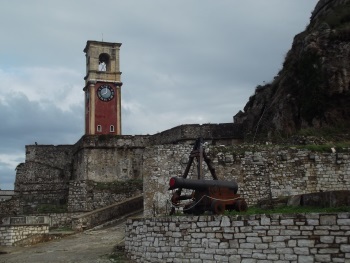 The fortresses of Corfu Town also feature in the TWHS Late Medieval Bastioned Fortifications in Greece. We have it as part of our connection 'Extensions on Tentative List.'. However, the description of the TWHS seems to hint at a complete new nomination covering the defensive works of several Greek islands! Probably the Greeks thought that when a number of Mexican colonial towns or French religious sites could become double WHS, why can't Corfu and Rhodes? I visited Corfu city after a short stay on the nearby island of Paxos (a much more pleasant destination). A larger place than I imagined, it is festooned with cafes and bars selling terrible food. After a Greek coffee and some lukewarm quiche we started with the Old Fortress, which was fortified by the Venetians and dominates the city’s east side. It is not much to look at, especially its tumble-down top, but you get a good view of the airport. In the heat of the day we later hiked up the hill at the other end of town to reach the top of the ‘New Fortress’. This fortress is more imposing than the Old one, but even harder to get a decent photograph of. Although entrance is free, tourists are tricked (ourselves included) into paying €3 by a wily group who stand by the entrance and offer you a “free” drink if you pay them for admission. There I encountered some of the worst toilets I have ever set foot in. The climb is worth it, though, because it affords a better view of Corfu than does the Old Fortress. The fortresses were massive and forbidding. But the town was depressing with so many restaurants, shops etc closed down. The Island is still easy to access, by air from Athens, and by ferry from Igoumenitsa & Patras (Greece), Bari & Brindisi (Italy) and Sarande (Albania). Lovely and relaxing, but not enough there to keep one more than a couple of days. The 1800s castle of the sad empress is lovely and romantic, but not old enough to be outstanding historically. In old town, it seemed many buildings still need repair from past earthquakes, but the church is really lovely. I especially enjoy the souvenir shops here with a combination of linens, jewelry and delightful food or beverage items like Kumquat liquor to try. the beaches about 20 minutes from town near the Monestary are nice. the whole island is small, so having a rental car can be very enjoyable. We visited the beautiful island of Corfu this summer. Corfu Town is the capital of the island and there are two fortifications at both ends of the city. The Old fortification is picturesque lying on an outstretched peninsula in the Ionian sea. However, it seems to be collapsing slowly following the bombings of World War II. The church of St. George in the fortress is worth a view. The New Fortress lies at the opposite end of the city and is in a much better state. The city is beautiful at night but beware of motorbikers! The architecture varies from Greek Orthodox type, to Venetian, to English. A view to St. Spiridion church is a must. Definitely worth a visit. The island of Corfu is mostly known as a holiday destination for its beaches and its green environment, which is quite unlike most other Greek islands. Its history is also unique among its sister islands, in that it has never been part of the Ottoman Empire (although the Turks have besieged the island many times). It was instead ruled by the Venetians, who have left many architectural traces, and then, succesively, by the Russians, the French, and the British, before it became part of Greece. The capital of the island, of the same name, has been a fortified place for many centuries, and has withstood the invasion attempts of many would-be conquerors (although it was the first of the Greek cities to submit to Roman rule). The city's architecture today is mainly of Venetian origin. The Venetians used the city to guard their Mediterranean trade routes against the Turks and thus constructed big fortifications there (both the Old and the New Fortress are worth a visit - I preferred the huge New Fortress over the smaller and more touristy Old Fortress, though). The historic part is well-preserved, and any visit to Corfu should include a trip to the capital, even though there was a lot of destruction in WWII and a lot of the architecture is from the British period (and thus not particularly remarkable). Corfu Town or Kerkyra lies only a few km outside the island's airport, which daily sees a steady flow of European charter flights. A 'blue bus' takes you into town for 1.50 EUR. The town itself is easily explored on foot. Theatres: Nobile Teatro di San Giacomo di Corf? Richard Lionheart: "Disguised as a Knight Templar, Richard sailed from Corfu with four attendants"